This is a library for Addon Authors. If you are a normal user, you have no use for this. As we all know, your saved variables aren't saved until the user reloads or logs out. And if their game crashes before that, any changes made to the saved variables are lost! For some addons, it's not a big deal, but for other addons (like FCOIS or Notebook) it could be HUGE! One day I lost 30 minutes worth of work setting/changing FCOIS markers and writing out a Guild Mail in Notebook because my game client crashed. That's when I decided to make this library. It warns the user when one or more addons have substantially changed their saved variables. What you consider a substantial change is up to you as the addon author using this library. You must keep the manifest txt file when you embed this library in your addon. Do not remove it! This is because this library has its own savedVariables file and addon settings panel. Does this now handle the addon auto-save stuff appropriately, with the new release? Ay, got it. Thanks for the explanation! I like the idea thanks for the lib. How does it check if something was changed or not within the addon? And is every change within the savedvars of this addon affected then, or only some? What's the difference between critical and non-critical changes then? No, wrong concept. The library can't tell when your saved variables change. YOU must tell IT. You call NonCriticalChange whenever YOU make whatever YOU consider to be a "minor" change of saved variables. What you consider major or minor is completely up to you. 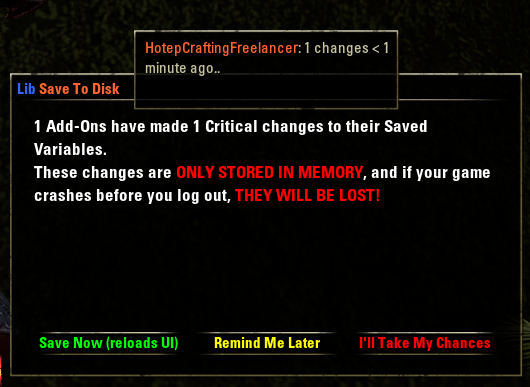 The addon then prompts the user according to their settings for LibSaveToDisk. 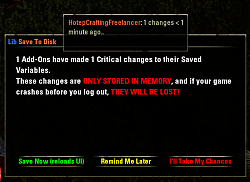 With default settings, they should be prompted less than 15 seconds after any addon calls CriticalChange, unless the user set a minimum minutes between critical change warnings. Basically, call CriticalChange if you think the user should reloadui as soon as possible. 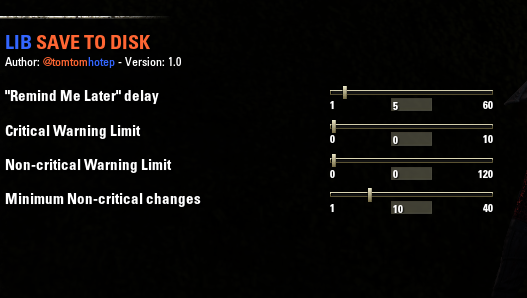 "non-critical" (or minor) changes are counted by the library until NonCriticalChange has been called x times (by any and all addons), where x is the user's setting for "Minimum Non-critical Changes" (default 10, slider currently allows 1 to 40). When that count reaches x, the user is prompted to reloadui. Oh, and if the user clicks "I'll Take My Chances" on the warning window, all counters are reset to 0, but the library is not disabled, i.e. new calls to the library functions still perform the same.